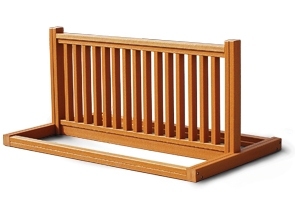 Solid and sleek bike rack constructed with 2" x 4" and 2" x 3" recycled plastic Resinwood slats. Designed to hold 6 to 10 bikes with the option to mount bikes to either side. Carefully spaced to maximize bike capacity and allow for use with the most common bike locks.